Howdy. On a rainy day like this here in Texas, nothing would cheer me up more than a Great Monday Give of a nice, vintage paperback of the book Many Moons.... oh, such a wonderful story. To be entered to win, just comment on this post before midnight, Sunday, May 3. A winner will be announced the next day and all's well that ends well. That said, the winner of last week's give, an awesome copy of Be Nice To Spiders, is Grace. Just e-mail me at webe(at)soon(dot)com and all will be good sister. Adios amigos. Slobodkin is one of our faves. Ha! Great minds think alike! 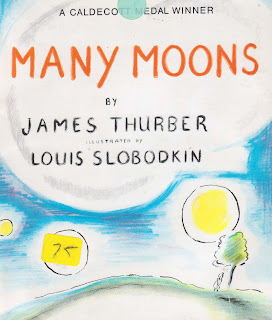 I bloged about Thurber's 13 Clocks only yesterday! I'd love to be able to read another of this amazing author's books to my daughter! PS Your blog is fantasmagorical! So good to be checking back in with you after a long time. I love your giveaways, and your blog! Glad I stumbled upon it. This was one of my avoulute favorites when i was little...so good! Thanks for the chance! We'd love a copy! I love this book! I always longed for a little necklace like hers when I was a little girl. I remember that book from when I was little ... such a wonderful story. BTW, is this contest international? Recent new reader, first time commenter. What a wonderful blog! Ooooh, count me in! We would love this, I just know it. I don't know this one but the moon has a special significance to us. Looks great. My son would love this. Count me in! James Thurber is one of my favorites, but I haven't read this - would love to add it to our collection! This would be the perfect addition to my new baby girl's collection! I'm sure my son would love to read this. Thanks for the chance to enter! I'd love this for my kindergarten class. We collect moon themed books!